OLYMPIA — House Democrats rolled out a nearly $10 billion transportation package Wednesday that would boost taxes on gasoline, increase car tabs and even charge a bicycle fee to raise money. We’re from the government. We’re here to help you. When I used to commute on a fixed-gear Cuevas track bike in Manhattan, I’d wonder at my sanity – when I wasn’t doing it. On the bike, I felt in charge of my situation or able to compromise; I looked down to make eye contact with drivers vying for a lane. 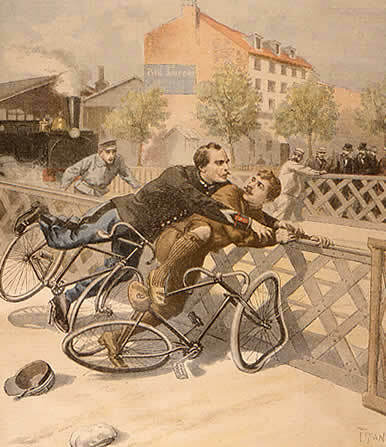 Now, down low on a footbike, I’m nervous around cars, even in a beach town in North Carolina. The funny thing is that it took about 4 hours of waiting in the hospital to realise this poster was about an activity I did. 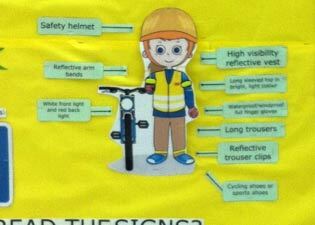 If this is how cycling had been promoted at school, I might have stuck to staying indoors playing computer games. Future trips to the hospital would have probably been have been due to sloth related heart and obesity problems rather than falling off the bike. I wish a cyclist would be someone who just happens to get on a bicycle and cycle from A to B. If you walk to the shops, you don’t have to put on your long trousers, helmet, high vis, and flashing lights. In November 2011 the active footbike countries (within IKSA) decided to talk about adding a master category in to footbike race competition. On the moment we see more racers in the older categories coming in our sport. The speed differents between someone of 40 and 50 years old can be large. To garuantee a certain level of competition we need to monitor this seriously. Becaus the added master category will mean a change for some in our sport the countries decided to embed it not earlier then January 2013. So coming summer in 2012 the categories used during footbike races stay as they are and then in 2013 we upgrade it. The Master category (40 years old to 49) will be inserted between the Seniors (to become 18-39) and Veterans (to become 50+). Age charts and more information are here. Facebook is settling government charges it deceived users that their information would be kept private, although it was repeatedly shared with the public, the Federal Trade Commission announced Tuesday. The deal, which carries no financial penalties, demands that the social-networking site obtain express consent of their 850 million users before their information is shared beyond the privacy settings they have established. Looks like the feds (who are enthusiastic beneficiaries of Facebook’s data sharing) are covering their derrieres, and maybe making future arrangements ( the deal ). As Captain Renault said, I’m shocked, shocked! Have fun on Facebook. Just sayin’. SILVERTON – Since 2002, Brice and Karen Hoskin’s Mountain Boy Sledworks has joined a rowdy ski area, a burly snowboardmaker and a funky telemark skimaker in elevating this town as a high-country hamlet of innovative thinkers and big-mountain toymakers. But after two years of well-publicized wrangling with Silverton officials over licenses, zoning, lights and banners, the Hoskins are moving their renowned sledmaking business and their growing Montanya rum distillery to Crested Butte, dealing a hefty blow to the isolated village of 500 and spreading worry throughout the local business community.